← Glacier Peak Holistics Pet Wellness Life Scan Stress Test or How Much BS Can Fit on One Web Page? I have discussed many time the evidence that homeopathy is nothing but a placebo. This has moved beyond the realm of reasonable doubt, and despite the misguided advocacy of homeopaths and some consumers, more and more governments (e.g. UK, Australia) are coming to acknowledge that time and money spent on homeopathic treatment is wasted and delays appropriate and effective medical care. Just as homeopathy is being challenged in the human healthcare field (e.g. disappearing from national healthcare in the UK), so it is being opposed by veterinarians who believe it offers only false promises to pet owners (c.f. efforts in the US, Australia, Europe, and the UK to discourage veterinary homeopathy). While these efforts are not always completely successful they represent a growing recognition that homeopathy offers no real health benefits and that suggesting it might and offering it as a treatment is unethical. [Marketers must] effectively communicates to consumers that (1) there is no scientific evidence that the product works and (2) the product’s claims are based only on theories of homeopathy from the 1700s that are not accepted by most modern medical experts. While it is unclear whether this rule will be enforced by the incoming administration, it indicates yet again that regulators are recognizing a duty to protect the public against false and unscientific medical claims for homeopathic products. Veterinary patients deserve the same protection! I have started a petition on change.org to ask Petco, one of the largest pet supply retailers, to discontinue the HomeoPet OTC product line and all other homeopathic products. Petco currently sells these remedies in stores and online, through Petco.com and its subsidiary Foster and Smith. These products clearly intend to falsely imply they can treat medical conditions in pets. With names like “Digestive Upsets,” “Anxiety Relief,” “Skin and Itch,” “Worm Clear,” “UTI+,” and so on, these products suggest they can treat real medical conditions when the evidence is clear and robust that they cannot. This misleads and deceives consumers and endangers pets whose owners waste time and resources on these products instead of seeking real medical treatment. So how can you help? Well first, SIGN THE PETITION! In addition, I am writing the company leadership. Since the CEO is schedule to step down in February, I have addressed my letter to his successor, currently President and Chief Merchant. I encourage anyone concerned about this issue to write the incoming CEO. My letter is copied below, and you are welcome to reuse any portion of it for your own contact with the company. 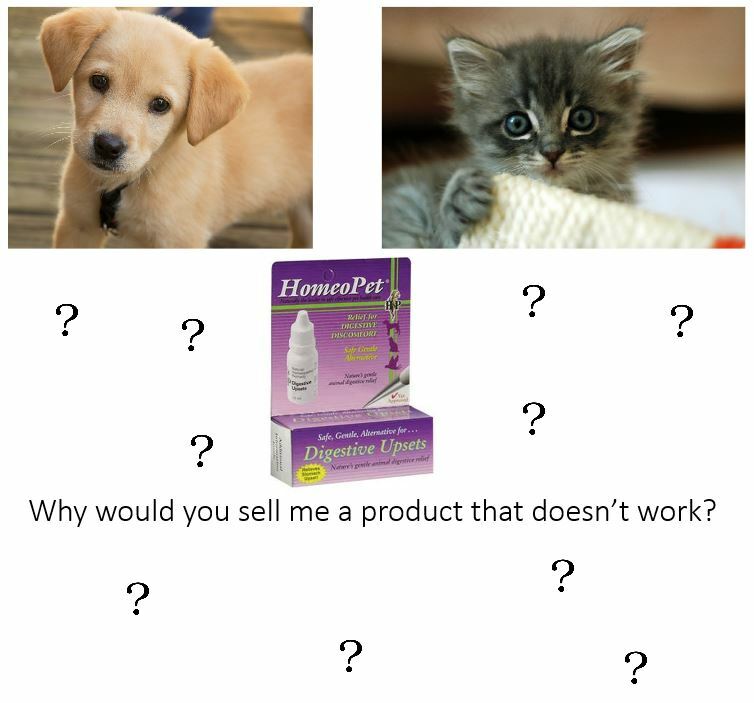 I am writing to ask that your company discontinue selling the HomeoPet product line and all other over-the-counter homeopathic products, whether sold online through Petco.com and Fosters and Smith or in your retail stores. These products offer no therapeutic benefit to your customers’ companion animals, and they can harm these pets by encouraging owners to delay seeking appropriate veterinary care. The scientific evidence is clear and robust that homeopathic products lack any benefit beyond placebo.1-2 This is widely accepted by regulators and other government agencies throughout the world.3-4 Here in the United States, the Federal Trade Commission (FTC) recently concluded that marketing over-the-counter homeopathic products constitutes false advertising unless clear disclaimers are present to inform consumers that any claim of benefit for these products is inconsistent with scientific evidence and consensus. For Petco to stop selling these ineffective products would be in the best interests of your customers, and the animals they care for, and consistent with your company’s mission to provide products that truly support animal health and well-being. Thank you for your attention. Ernst E. A systematic review of systematic reviews of homeopathy. British Journal of Clinical Pharmacology. 2002;54:577-582. Shang A, Huwiler-Muntener K, Nartey L, Juni P, Sterne J A C, Pewsner D et al. Are the clinical effects of homoeopathy placebo effects? Comparative study of placebo-controlled trials of homoeopathy and allopathy. Lancet 2005; 366:726-732. Great Britain. Parliament. House of Commons. Select Committee on Science and Technology. Evidence check 2: homeopathy : fourth report of session 2009-10 : report together with formal minutes, oral and written evidence. 12 Responses to Petition Petco to Stop Selling Worthless Homeopathic Products! That said, there are hundreds of online pet stores that sell homeopathy – it’s consumer demand, unfortunately. Look how long it took Petco to take cocoa mulch off their shelves? Most all pet stores also still sell harmful flea and tick products (think Hartz, Sergeants etc and even new manufacturers on the market selling these) among other undesirable products. GNC for pets, anyone? (Petsmart for example, has taken many, many popular and useful brand products off their shelves and replaced them with questionable products, it boggles the mind why). Sure, consumer demand, and the profit that follows from it, will always matter more to retailers than what is medially appropriate or scientifically safe and effective. That’s why we need a robust, science-based regulatory system. Still, all one can do is try to make change where one can. The less visibility these products have, the less they are normalized and viewed as real just by virtue of familiarity in the minds of consumers. Or you can find a local independent retailer. Yes, there are tons of us out there that fall for this crap but there are a few that don’t. Not to mention supporting smaller businesses have better economic benefits for communities. And we are more likely to listen to our customers but also gently educate them into why something like that won’t work. I could be naive of course because I do that but I know that many stores don’t. My store happens to not carry any supplements (except for fish oil) because, well we know, 99.9% of them don’t work. Everyday I have to deal with customers coming in an asking for stuff that doesn’t work, mostly because their vet said they should have their dog on some form of supplement. Not to put too much on Vets but they are important in educating their patients about stuff like this. And much like Human doctors they are taken in by wishful thinking about crap like this. I’m not saying that independents are any better than Petco or Petsmart in selling this drek but at least at my store we don’t. And I refuse to sell snake oil. Though I could make a ton of money fleecing pet owners daily. A lot of this is just common sense. Read the ingredients on the label. Look at the disclaimer. Unfortunately, L, to those not truly educated, it actually is rocket science to them. The FTC reports found that a large number of people never paid attention to the quack miranda labels, and for the many people, thought that anything on a retail shelf meant that it was safe, approved or regulated by the government. It happens way more often than I’d like to see–people trust that all products are safe and effective, as why would Petco sell them otherwise? The most common presentation would be a client coming to my clinic with a worm-riddled pet that all the Wrm Clear in the world didn’t fix. Someone on another forum wants to try kochi free as a remedy for giardia. Look at the ingredients. Now, another one is recommending d-mannose to treat UTIs! I’m going to have to shut my computer down for a week or two. If I present them with facts I am often met with hostility. I don’t know how you do it, SkeptVet, but, I am glad that you do. Many of us are listening and appreciate your efforts. A recent study concluded that around 60% of drugs prescribed by GPs are not necessary and mostly have a placebo effect although some do have side effects. Most of the ailments they are prescribed for would get better on their own. Homeopathy has not effect but does no harm in itself. I know intelligent people who swear by it. Placebos can be excellent providing they don’t delay diagnosis of a treatable condition. Placebo effects are generally small and only change the perception of disease, not the disease itself. This has some value for patients,but it can be had as an extra benefit along with truly effective therapies, so there is no need for things that are nothing but placebo, whether alternative or conventional. Here is a nice summary of the downside of using placebos. As for the claim that more than half of drugs used in conventional medicine are only placebos, I am open-minded but skeptical. What is your evidence for this claim? Perhaps I didn’t put that quite right. What I meant was that the research published in the UK and widely publicised, showed that if doctors only gave placebos in 60% of cases, the patients would get better just the same. Many patients are prescribed antibiotics because they think that that is what they need to get better ( and we all know about the overuse of antibiotics ) There is also is recent research which appears to show that chronic pain stops responding to over the counter and most prescription pain killers after around 6 weeks. That they act as a placebo after that. Ah, I see what you’re saying. Yes, it is true that many common complaints get better spontaneously, which is a large part of why placebo therapies can seem to be effective.